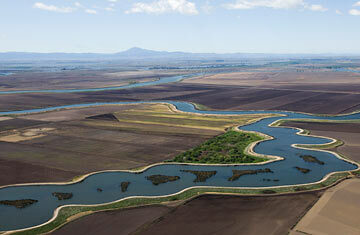 An aerial view of the Sacramento-San Joaquin Delta in California. Buildings may topple and lives may be lost if the Big One shakes the wrong part of California but another catastrophic consequence of an enormous earthquake in the San Francisco area may involve water. Two thirds of the state's drinking water supply flows through the gigantic Sacramento-San Joaquin River Delta region east of San Francisco Bay  and the levees that help direct the massive amounts of water south to farmlands and cities are so antiquated that many may simply collapse with a major temblor. The resulting flooding could also put California's huge farm belt, hundreds of thousands of businesses and millions of residents at enormous risk. Everyone has known of that doomsday scenario for years  a time in which the needs of farmers, the ambitions of environmentalists and the thirst of cities clashed. The big news this week is that California finally passed legislation to overhaul the state's aging water system. Governor Arnold Schwarzenegger called it "an historic agreement" and promised to sign into law. "Water is the lifeblood of everything we do in California," Schwarzenegger said. "Without clean reliable water, we cannot build, we cannot farm, we cannot grow, we cannot prosper." The legislation proposes billions to repair and protect the largest estuary on the West Coast. The twin goals of the legislation are a massive restoration of the Delta's ecosystem, a project akin to saving the Everglades in Florida, and a new modern conveyance system to move water through the Delta and around the state with conservation and efficiency. It is an intricate one as well because the giant pumps that speed water to state and federal aqueducts have played a part in bringing the Delta to the verge of ecological collapse in the first place. For 50 years, the Sacramento-San Joaquin Delta has funneled the Sierra Nevada snow runoff from the Sacramento Valley in the north to the giant farms in California's central valley and the now nearly 20 million people who live in Southern California. Both the economy and population of California are growing, but the amount of available water remains the same, or declines, as is currently the case with the state's worst drought in two decades. The legislation creates a new seven-member council to oversee and restore the fragile Delta, imposes a 20% conservation mandate for cities by 2020 and requires the monitoring of groundwater levels throughout the state. It also places a $11.1 billion bond on next November's ballot to pay for overhauling the water system. The bond measure is larded with water projects statewide in an attempt to encourage passage. For decades, governors and legislative leaders have vowed to fix the state's increasingly fragile water system that was built by former Governor Pat Brown in the 1960s when the state's population was 11 million. Today, the Golden State has nearly 38 million residents and the population is expected to grow to 50 million. In a recent speech, Pat Brown's son, state Attorney General Jerry Brown, the former governor who leads in polls to succeed Schwarzenegger, recounted the perils of water politics in California. In 1981, Brown signed a bill to build a periphery canal, which would have transported Sacramento River water around the ecologically fragile Delta and directly into a southbound aqueduct. "After passage an unholy alliance united against it," said Brown. "Farmers thought there were too many environmental restrictions and environmentalists thought there was not enough environmental protections. They ganged up and put an initiative on the ballot which won and killed the canal." The creation of the Delta council in the new legislation finally paves the way for a canal. Even now, not everyone is happy with the package of bills Schwarzenegger says he will sign. Many key provisions were weakened during the final weeks of negotiations, and the Sierra Club, for one, opposed the legislation, saying too little is being achieved. But frequent foes in the past, including the Westlands Water District, representing agribusiness, and the Metropolitan Water District of Southern California, the state's biggest urban supplier, came together to support the legislation. "No one is getting 100% of what they want," says Assembly Speaker Karen Bass, a Los Angeles Democrat, but "it is the only way to balance the many different individual interests for the overall greater good."